A Software QA Tester basically tests software to ensure there are no bugs, both in the front and back ends. 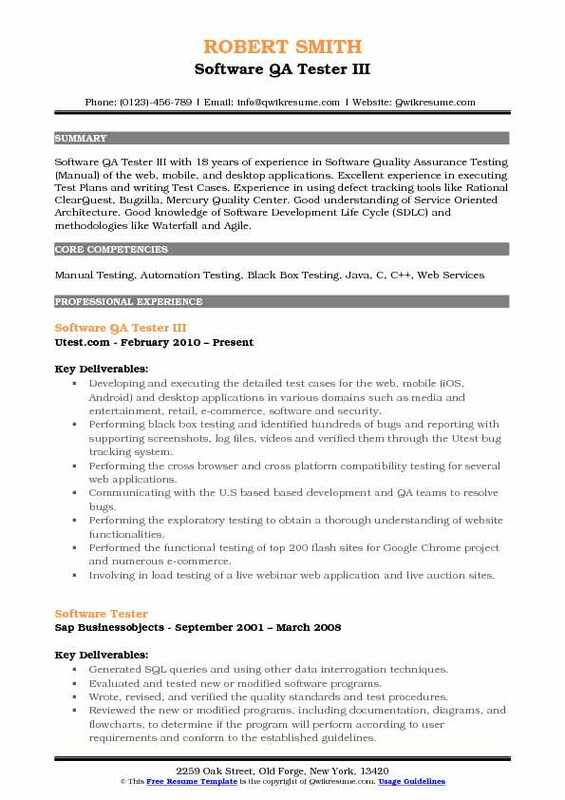 Some of the key responsibilities that can be seen on the Software QA Tester Resume are – providing basic as well as advanced suggestions for streamlining the user interface to make it more convenient for the user, locating issues and providing complete information on the same, and analyzing the test results as well as logs. Some important skills that are expected from this job role area flair for debugging, knowledge about both manual and automated testing strategies, and in-depth knowledge about all the current testing trends and tools. 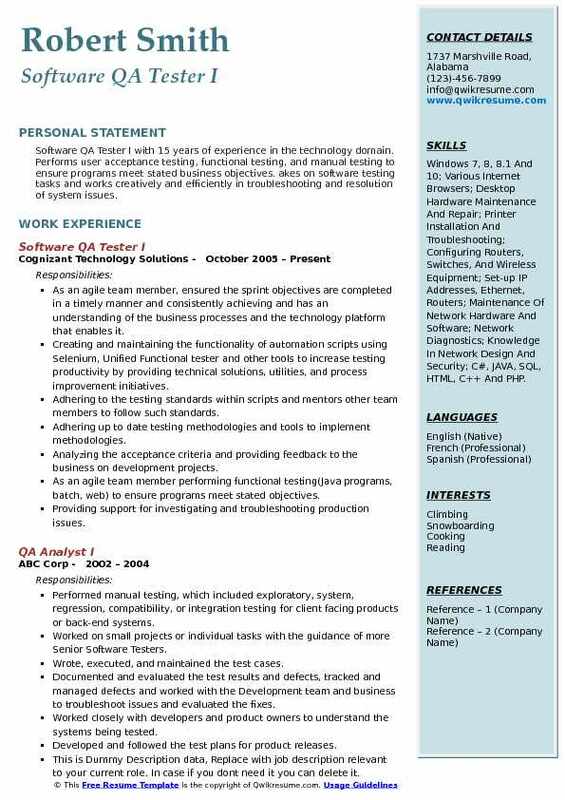 The educational qualifications expected of Software QA Testers typically include a Bachelor’s Degree in Computer Science Engineering or Information Technology. Other engineering degree holders with relevant work experience are also eligible for this job profile. Objective : Skilled Junior Software QA Tester with over 4+ years in Quality Assurance and Software Testing experience both Web-Based/mobile applications and client-server Applications. Experienced with SDLC including traditional Waterfall and Agile/Scrum methodologies. Testing of the professional social network for talents, models, and clients. Testing of the native mobile app, secure VPN keyboard, with lots of plugins. Testing of multi-language iOS app for finding and booking best Spas, Barbershops, Nail, and Massage salons. Preparing test traceability matrix to confirm the test coverage and mapped it with the test cases. Interacting with the developers and business users to communicate the defects using Jira, actively participating in replicating the bugs, and performing the regression testing. Creating test data using SQL, writing SQL queries for back-end testing. Coordinating acceptance testing processes documented and addressed all the issues during the testing. Interacting with the development, configuration, and operations team to ensure the quality of software meets users expectations. Verification of various components integration of the application and end-to-end testing execution. Participating in the design review, requirement analysis, and releasing the review meetings. 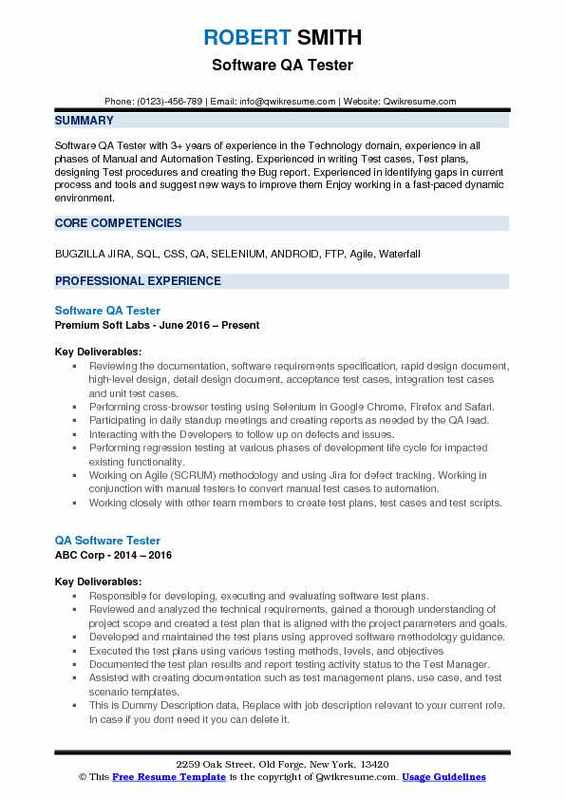 Objective : Software QA Tester with 3+ years of experience in the Technology domain, experience in all phases of Manual and Automation Testing. Experienced in writing Test cases, Test plans, designing Test procedures and creating the Bug report. Experienced in identifying gaps in current process and tools and suggest new ways to improve them Enjoy working in a fast-paced dynamic environment. Reviewing the documentation, software requirements specification, rapid design document, high-level design, detail design document, acceptance test cases, integration test cases and unit test cases. Performing cross-browser testing using Selenium in Google Chrome, Firefox and Safari. Participating in daily standup meetings and creating reports as needed by the QA lead. Interacting with the Developers to follow up on defects and issues. Performing regression testing at various phases of development life cycle for impacted existing functionality. Working on Agile (SCRUM) methodology and using Jira for defect tracking. Working in conjunction with manual testers to convert manual test cases to automation. Working closely with other team members to create test plans, test cases and test scripts. Developing requirement traceability matrix (RTM) and test summary report (TSR). Working with the team for requirement analysis, test strategy, and test plan creation. Involving in analyzing the business requirements documents and functional design documents. Involving in writing and implementation of test cases for various modules. Involving in functional, regression, integration, system testing and user acceptance testing. Objective : Junior Software QA Engineer with 4 years of hands-on experience in Web and Mobile-based applications testing in Agile, Waterfall, and Spiral cycle Emphasis upon a people first approach facilitating and leading. Proven relationship-building skills with software engineers, QA engineers, and external teams In-depth knowledge of project documentation especially preparing complex test plans & design test cases. Excel at participating in efficient, results-driven projects. Taking part in QA effort for multiple web and mobile software applications developed by the company for its domestic and international clients. Tested an application where users can create, mix video clips and share it with other people all over the world. Tested a web application, which was made for employers like a place, where they can hire people, and for the employees like a place, where they can get a job. Developing test strategies, test plans, and test cases and user stories for software development efforts and SQA strategies using agile-testing methodology. Involving in the design and implementation of enhancements and customizations. Executing the test cases and documenting the results, reporting the defects and tracking the status. Involving in functional testing, black box testing, negative testing, compatibility testing, and recovery testing. Actively participating and interacting with Product Management teams in the review and analysis of functional requirements. Involving in testing various business rules user/customer functionality, change process, configuration data requirements, legacy data requirements, and access permissions requirements. Executing SQL queries to ensure the data integrity by checking various kinds of constraints. Successfully installing and configuring the multiple test environments using virtual machines. Performing functional, performance and end-to-end testing for the applications under test. Objective : Over 3 years of experience in Quality Assurance Testing of both Mobile and Web-Based Applications using Manual Procedures and Automated Tools. Extensive knowledge and experience in all stages of Software Development Life Cycle beginning from initiation and definition to deployment and support. 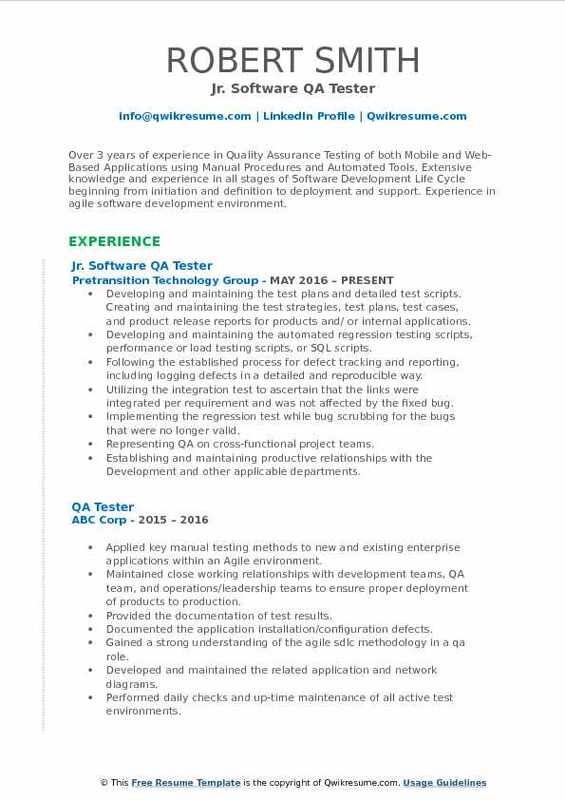 Experience in agile software development environment. Developing and maintaining the test plans and detailed test scripts. Creating and maintaining the test strategies, test plans, test cases, and product release reports for products and/ or internal applications. Developing and maintaining the automated regression testing scripts, performance or load testing scripts, or SQL scripts. Following the established process for defect tracking and reporting, including logging defects in a detailed and reproducible way. Utilizing the integration test to ascertain that the links were integrated per requirement and was not affected by the fixed bug. Implementing the regression test while bug scrubbing for the bugs that were no longer valid. Representing QA on cross-functional project teams. Establishing and maintaining productive relationships with the Development and other applicable departments. Estimating the testing requirements for input into planning efforts. Providing suggestions for best practices and process improvement. Providing support for the maintenance of QA test environments. 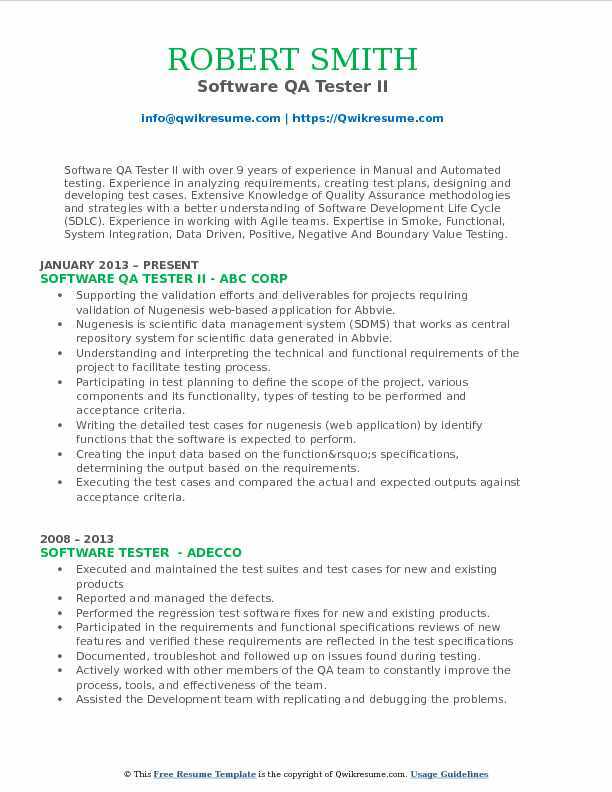 Summary : Software QA Tester I with 15 years of experience in the technology domain. Performs user acceptance testing, functional testing, and manual testing to ensure programs meet stated business objectives. akes on software testing tasks and works creatively and efficiently in troubleshooting and resolution of system issues. Skills : Windows 7, 8, 8.1 And 10; Various Internet Browsers; Desktop Hardware Maintenance And Repair; Printer Installation And Troubleshooting; Configuring Routers, Switches, And Wireless Equipment; Set-up IP Addresses, Ethernet, Routers; Maintenance Of Network Hardware And Software; Network Diagnostics; Knowledge In Network Design And Security; C#, JAVA, SQL, HTML, C++ And PHP. As an agile team member, ensured the sprint objectives are completed in a timely manner and consistently achieving and has an understanding of the business processes and the technology platform that enables it. Creating and maintaining the functionality of automation scripts using Selenium, Unified Functional tester and other tools to increase testing productivity by providing technical solutions, utilities, and process improvement initiatives. Adhering to the testing standards within scripts and mentors other team members to follow such standards. Adhering up to date testing methodologies and tools to implement methodologies. Analyzing the acceptance criteria and providing feedback to the business on development projects. As an agile team member performing functional testing(Java programs, batch, web) to ensure programs meet stated objectives. Providing support for investigating and troubleshooting production issues. Working with the team members to provide testing statuses, keeping the team informed of new requests/changes in processes/procedures, including escalating testing issues and issues requiring management attention. Participating in the industry and other professional networks to ensure awareness of industry standards, trends and best. Practicing in order to strengthen organizational and technical knowledge. Taking on software testing tasks and working creatively and efficiently in troubleshooting and resolution of the system. 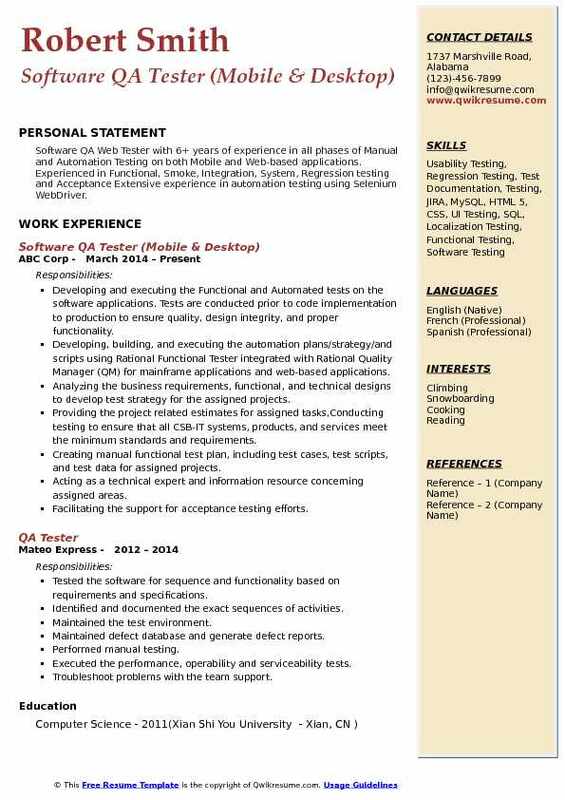 Headline : Senior Software QA Tester with 7+ years of IT experience in Software Testing, Testing processes and Automation frameworks. Experienced in Test Methodology, Test Plans, Test Cases and Test Scripts on UNIX and Windows platforms. 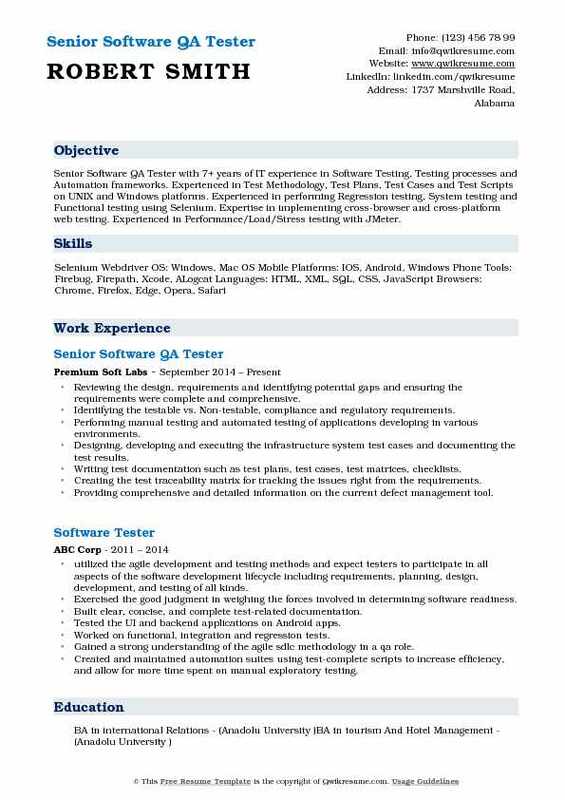 Experienced in performing Regression testing, System testing and Functional testing using Selenium. Expertise in implementing cross-browser and cross-platform web testing. Experienced in Performance/Load/Stress testing with JMeter. Reviewing the design, requirements and identifying potential gaps and ensuring the requirements were complete and comprehensive. Identifying the testable vs. Non-testable, compliance and regulatory requirements. Performing manual testing and automated testing of applications developing in various environments. Designing, developing and executing the infrastructure system test cases and documenting the test results. Writing test documentation such as test plans, test cases, test matrices, checklists. Creating the test traceability matrix for tracking the issues right from the requirements. Providing comprehensive and detailed information on the current defect management tool. Writing the SQL queries for back end verification and validation using several SQL statements. Using the Selenium Webdriver to test the websites and their systematic updates for functionality, usability, regression, performance, browser and operating systems compatibility. Performing regression testing for new builds and every modification in the application. Participating in the maintenance and refinement of internal quality control programs. Determining and executing the appropriate system-side testing for each project. 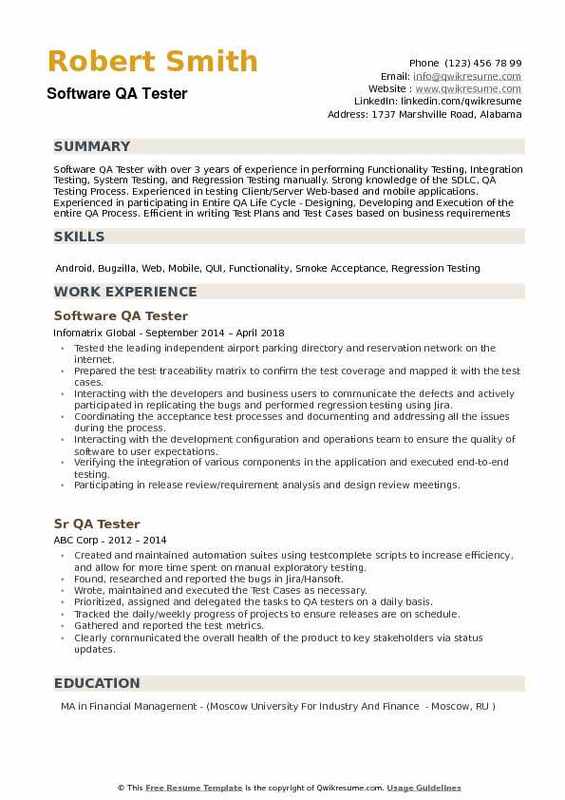 Summary : Software QA Tester II with over 9 years of experience in Manual and Automated testing. Experience in analyzing requirements, creating test plans, designing and developing test cases. Extensive Knowledge of Quality Assurance methodologies and strategies with a better understanding of Software Development Life Cycle (SDLC). Experience in working with Agile teams. Expertise in Smoke, Functional, System Integration, Data Driven, Positive, Negative And Boundary Value Testing. Supporting the validation efforts and deliverables for projects requiring validation of Nugenesis web-based application for Abbvie. Nugenesis is scientific data management system (SDMS) that works as central repository system for scientific data generated in Abbvie. Understanding and interpreting the technical and functional requirements of the project to facilitate testing process. Participating in test planning to define the scope of the project, various components and its functionality, types of testing to be performed and acceptance criteria. Writing the detailed test cases for nugenesis (web application) by identify functions that the software is expected to perform. Creating the input data based on the function’s specifications, determining the output based on the requirements. Executing the test cases and compared the actual and expected outputs against acceptance criteria. Writing the detailed test cases for sdms helper (client based application) and created input data to validate metadata tags values generated by sdms helper application and corresponds to Nugenesis web application. Creating detailed bug reports in Jira which includes the description, screen shots and steps to reproduce (STR) for the developer to easily understand the bug. 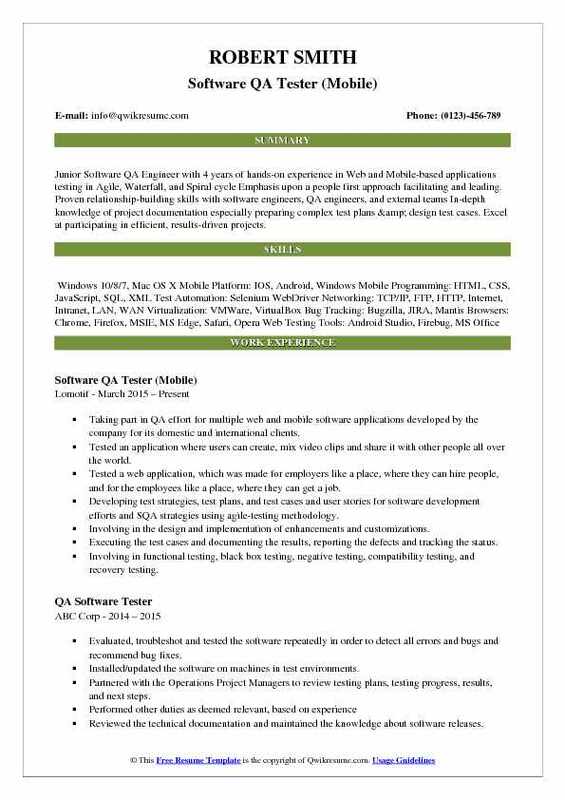 Summary : Software QA Tester III with 18 years of experience in Software Quality Assurance Testing (Manual) of the web, mobile, and desktop applications. Excellent experience in executing Test Plans and writing Test Cases. Experience in using defect tracking tools like Rational ClearQuest, Bugzilla, Mercury Quality Center. Good understanding of Service Oriented Architecture. Good knowledge of Software Development Life Cycle (SDLC) and methodologies like Waterfall and Agile. Developing and executing the detailed test cases for the web, mobile (iOS, Android) and desktop applications in various domains such as media and entertainment, retail, e-commerce, software and security. Performing black box testing and identified hundreds of bugs and reporting with supporting screenshots, log files, videos and verified them through the Utest bug tracking system. Performing the cross browser and cross platform compatibility testing for several web applications. Communicating with the U.S based based development and QA teams to resolve bugs. Performing the exploratory testing to obtain a thorough understanding of website functionalities. Performed the functional testing of top 200 flash sites for Google Chrome project and numerous e-commerce. Involving in load testing of a live webinar web application and live auction sites. Performing sanity testing of a security software which enables credit card holders to check their charges for fraudulence. Performed the GUI testing of Facebook gaming and video applications. 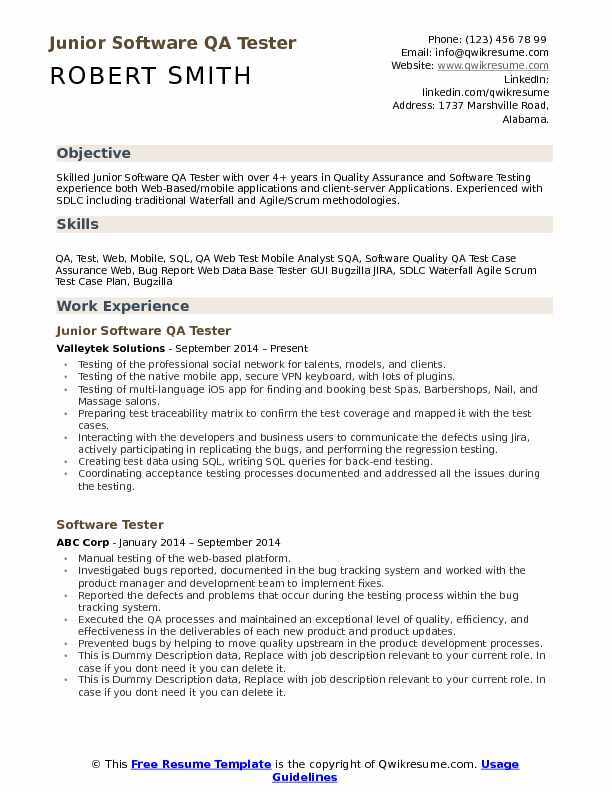 Headline : Software QA Web Tester with 6+ years of experience in all phases of Manual and Automation Testing on both Mobile and Web-based applications. Experienced in Functional, Smoke, Integration, System, Regression testing and Acceptance Extensive experience in automation testing using Selenium WebDriver. Developing and executing the Functional and Automated tests on the software applications. Tests are conducted prior to code implementation to production to ensure quality, design integrity, and proper functionality. Developing, building, and executing the automation plans/strategy/and scripts using Rational Functional Tester integrated with Rational Quality Manager (QM) for mainframe applications and web-based applications. Analyzing the business requirements, functional, and technical designs to develop test strategy for the assigned projects. Conducting testing to ensure that all CSB-IT systems, products, and services meet the minimum standards and requirements. Creating manual functional test plan, including test cases, test scripts, and test data for assigned projects. Acting as a technical expert and information resource concerning assigned areas. Facilitating the support for acceptance testing efforts. Creating and maintaining a reusable test script library using specified templates in Rational QM. Co-ordinating and working closely with the IT compliance team to resolve issues. Mentoring testers and developers on test standards. Tested the leading independent airport parking directory and reservation network on the internet. Prepared the test traceability matrix to confirm the test coverage and mapped it with the test cases. Interacting with the developers and business users to communicate the defects and actively participated in replicating the bugs and performed regression testing using Jira. Coordinating the acceptance test processes and documenting and addressing all the issues during the process. Interacting with the development configuration and operations team to ensure the quality of software to user expectations. Verifying the integration of various components in the application and executed end-to-end testing. Participating in release review/requirement analysis and design review meetings. Responsible for testing of new functionality and enhancements, regression testing, system end-to-end testing, functionality testing, block box and gray box testing, integration testing, negative and adversarial testing. Creating, executing the test sets and maintaining the documentation of test results. Monitoring and tracking the defects/risks and managed through resolution using Bugzilla. Analyzing the test results reports and test cases results and determined causes, and creating a detailed and comprehensive defects reports. Participating in the test environment setup ensuring that the facilities, test tools, and scripts are in place to successfully perform the required testing effort by the regression team.